"How can we make this job as affordable as possible for the customer"
"treat every customer, like our only customer"
We provide both flexibility in scheduling customers in at a time convenient for them as well as putting ourselves in the customers shoes and asking "how would I want this job handled if I were Mr. Jones". So You Want To Know More About Ole' Trash Can Willys? We put a lot into our employees and our culture. We want happy employees, dedicated to our cause... Providing you with a professional staff that cares that you were thrilled and WOW'd by our service. Steve (aka Willy) Lives in Litchfield New Hampshire with his wife of 10 years and 3 children. Steve is a US Navy veteran, involved in the community and a dedicated husband and father. Steve prides himself in his honor and keeping his word. We think it shows in how we do business. We still believe in people and the bond a handshake seals. Steve is our resident "Big Guy Teddy Bear"! His physical presence can be intimidating to those that peak through the door when he comes a calling, don't let it fool you. Steve is one of the most friendly and helpful crew members we have and truly cares that our customers are left satisfied and happy. He keeps crew members on their toes to ensure you get the best service possible. We are not just saying this because it's protocol for an about page. Our crew members go through an extremely extensive background check, pre-employment check, drug screening, and are trained extensively for a 3 month period where new crew members are kept under a watchful eye. Through this probationary time frame we get to know our staff very well and some don't make the cut. You would be extremely surprised and impressed with the process for a "garbage disposal company" on what we put these guys through. The reasoning is our company culture is not taken lightly. After completing their training these crew members are like family to us and that is the way the business is ran, with a family "feel" to it. All said, anyone of these guys we would trust watching our kids, homes, and personal belongings with the fullest of confidence. They have all demonstrated sincere and real character as we have gotten to know each one of them. Where Did The Name Come From Anyways? Steve - "I chose the name keeping with the idea of making it fun for customers and staff. There was a show years ago called crank yankers, they would pretend to make prank phone calls and one of the characters I found hilarious, his name??? 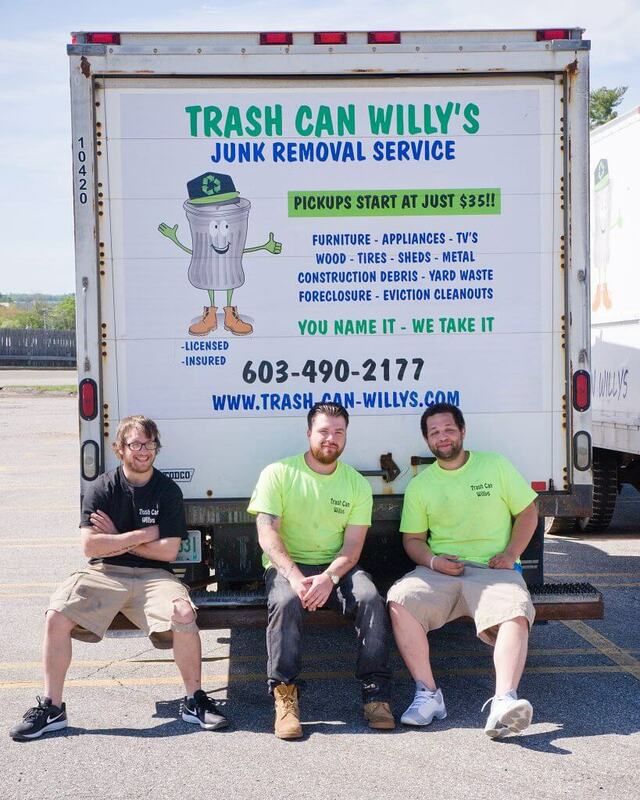 Junk Yard Willy, we decided on Trash Can Willys and ran with it and LOVE the name. I wanted our name to be fun and different and unique instead of all these stupid 800 junk company spin offs." The company and ethics have worked, worked out greatly to this point. We think our principles have helped make that happen. We operate with pride and a "can do happily" attitude because we love what we do. 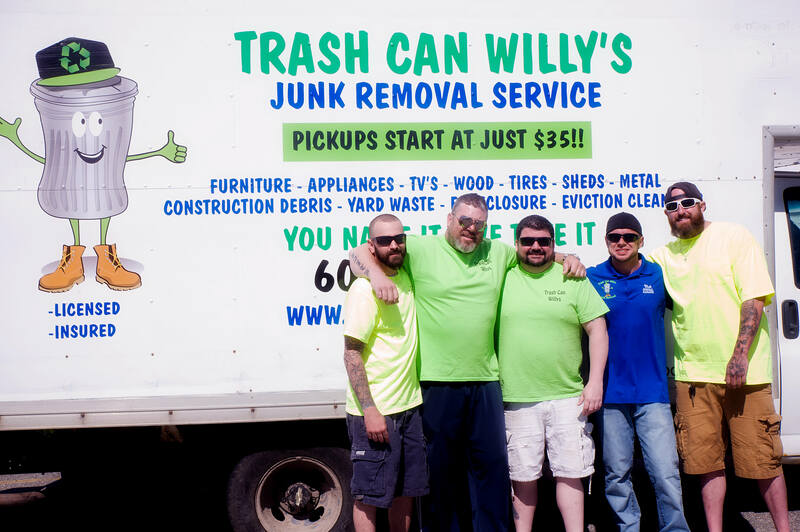 We help our customers, we do favors on-site moving furniture around for the elderly lady living alone, to helping the "Do It Yourselfer" bring in a heavy dresser while we're there doing a junk pickup just to lend a hand. Steve: "I like to think we are an "old school" company, standing behind our hand shakes and doing exactly what we say we are going to do, when we say we will do it, and for how much we said we would do it for. I have always taken honoring my word to people with great pride and operate our company that way. Sure, we aren't always perfect, every now and then a piece of junk may be overlooked, or we ran slightly late for a pickup, things happen in life. I can tell you we always make things right - from calling ahead to let our customer know we are running behind to going back for that missed tire under the deck and so on. Its the greatest reward when we leave our customers, pulling away in the truck and knowing they liked us, the service, and the price... such a great feeling of accomplishment each stop, each day, each year. Hence why we from 30% on the bottom line EVERY SINGLE YEAR. That says we are doing something right, a lot. We have all the proper protections for our customers, staff, and property in place. We carry all needed insurances and haven't had an issue in going on 9 years of business. In the area the last 8 years many other small "fly by night" companies have opened and advertise heavily but do not have ANY insurances in place. That means if something breaks on your property you aren't covered, if one of their employees gets hurt you are at risk of being sued by that uninsured employee, and unfortunately many of these companies will drive out in to the woods and illegally dump your items to avoid proper disposal practices and the costs that go along with them, this puts both you and them at risk by Federal Illegal Dumping code enforcement done through the EPA. Please consider this, not only do we offer very fair pricing, we also protect you, your home, our staff, and the environment from any unwanted circumstances. This is a big thing to consider when thinking about a local trash disposal company. 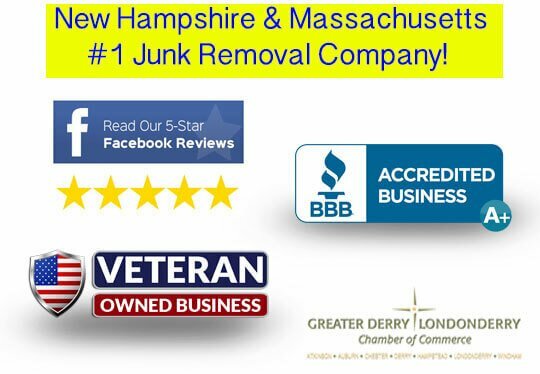 In closing, I do hope we gain the opportunity to be plugged in on your mobile phone contacts list to be used when you need your junk removed fairly, safely, and responsibly. We hope to hear from you and good luck with the junk!! !